The stories (in prose and poetry) of migrant farmworkers, veterans, stroke victims, and others requiring rehabilitative care that fill this journal are reminders that rehabilitation has both literal power and metaphorical power. The desire for social and political rehabilitation seems to dominate public (and private) discourse not only in the United States but also in many other parts of the world. “What does it mean to flourish?” asks Alison Cogan in her reflection on how to not merely live, but also to thrive in the wake of a traumatic injury or illness.1 One pathway is through storytelling. We have returned to themes from that book in the months since the 2016 election.3 We have been particularly appalled by the uncivil, poisonous nature of political discourse during and after the campaign. In our book, we contend that effective citizenship requires substantive knowledge, the ability to handle ambiguity and complexity, and, perhaps most importantly, empathy. We see the absence of these skills reflected in dramatic ways in our society; the impact is profound, both nationally and globally. Recognizing these limitations, we welcome (and are humbled by) the invitation to contribute to this journal, and to explore a central point in our work with a new audience. Our point of departure is that many of the critical citizenship skills and dispositions that we identified seven years ago in the liberal arts extend across the curriculum, clearly and compellingly, to the audience reading this journal. First, our book highlighted the importance of substantive, technical knowledge in educating for effective citizenship. Our colleague Michael Burke, for example, teaches us that mathematical knowledge is required in order to speak authoritatively on issues ranging from nuclear power to overpopulation. One need not be a professional mathematician to understand these issues, but without the ability to comprehend their mathematical complexities, one starts off at a deficit. Additionally, Matt Fisher discusses teaching concepts of biochemistry by engaging his students with “real world” case studies. His students are not only able to understand the chemical properties of HIV for example, but also become more knowledgeable about how to address issues concerning the spread of AIDS, including the complex ethical and historical dimensions of the crisis. As Sullivan and Rossi suggest, “the humanities cultivate the appreciation of uncertainty, whereas the sciences develop students’ ability to come to provisional conclusions about observable and measurable phenomena” .4(p45) The necessary interplay of science and the humanities is not only essential for cultivating practitioners who are thoughtful citizens but is a raison d’être of this journal itself. Professionals in the medical field face a relatively unique reality: as we learn more, our previous knowledge is often found incomplete, and in many cases, wrong. This is not a sign that science is failing; in fact, this constant recalibration of what we know and do not know suggests that science is working.6 As one of us (Michael) argues in our book (discussing having his students do research on local environmental history), getting students to engage in actual scholarship helps them to become better scholars of their field than they could be if they only read about research others are doing. The experience of doing research, as is increasingly common in the healthcare fields, has this effect on practitioners in rehabilitative medicine, and across the medical field. As the readers of this journal know, healthcare providers cannot always wait for researchers to pull together new compendia of knowledge; they must be on the front lines, reading the articles and judging for themselves. For those working full-time in the field (as opposed to students majoring in a subject as undergraduates), it is not enough to have substantive knowledge of their subject. It is essential that they possess a strong epistemological understanding of what constitutes knowledge in the field, and couple this understanding with a commitment to lifelong learning. These commitments are as important an element in citizenship education, broadly speaking, as they are in the training of rehabilitation specialists. Our work illustrates the importance of considering multiple perspectives on knotty issues. Teaching an interdisciplinary honors capstone seminar, one of us (Rebecca) invites her students to address a substantive world or local problem (e.g., the future of democracy in Iran or school choice in Milwaukee). Rebecca has the students address the issue through the eyes of their undergraduate major, thus bringing many different disciplinary perspectives to bear on a complex problem. Likewise, when one of us (Jeffrey) has his students address controversial issues such as affirmative action and school prayer, he has them approach those issues by very explicitly considering their own views, as well as the views on other sides. In both cases, as students engage in dialogue on the issue and collaborate with one another, their understanding of the issue both widens and deepens. Unlike the hedgehog who knows just one thing, they now understand how others think about the issue, and hence have a broader understanding of it. Growing numbers of healthcare professionals now recognize that working in silos does not provide the same quality of care as would an interdisciplinary approach. Indeed, this journal is dedicated to the proposition that humanistic perspectives on rehabilitative medicine are vital to good practice. When considering how to treat a patient in a rehabilitation setting, specialists from a variety of areas ideally come together to coordinate care. David J. Clarke, for example, observes that working with a patient who has suffered from a stroke might require physiotherapists, occupational therapists, speech and language therapists, and nurses;9(pg6) rehabilitation for someone who has been in an accident would require a similarly cross-disciplinary team.9 All must be able to work together and understand how to wrestle with the ambiguity and uncertainty involved in solving complex problems. Considering multiple perspectives is central to effective treatment; in the most complex cases, there is often not one clear best answer. Acknowledging ambiguity can be hard, especially for someone who has developed significant expertise on an issue from long immersion in a particular disciplinary way of knowing. Effective citizenship education ought to help us appreciate that contending with ambiguity and uncertainty is a virtue rather than a failing, much as Sullivan and Rossi suggest happens when both the humanities and the sciences inform our worldview. Finally, and perhaps most importantly, one of the central arguments in our book is that effective citizenship is fundamentally relational, and therefore requires empathy. Being a good citizen requires that a person understand the lives other people experience—their joy and their suffering—and requires that one must work to ease the troubles others face. In his chapter of the book, Howard Tinberg explores the role of empathy in helping students to come to grips with the literature from the Shoah (Holocaust); understanding the Holocaust, as Tinberg argues, requires that we find empathy, even if doing so comes at great personal pain. Colby and Sullivan share this perspective when they discuss how educating students in a civic and moral manner will help them to become open to the perspectives and experiences of others. We explicitly do not argue that empathy must arise from a left-wing political tint. To take an issue like health insurance, for example, we would argue that all good citizens should deeply care that some people go through life with no (or inadequate) access to health insurance, and therefore experience worse financial and medical outcomes as a result. Not to care strikes us as coldhearted and wrong. Reasonable people can disagree whether these twin problems of cost and access can be solved by government action or market-based approaches (or a combination thereof). They can argue over whether the individual mandate is constitutional, as the U.S. Supreme Court did in 2012.10 But, from our perspective, an individual who lacks the capacity to understand the stresses of going through life without health insurance, or of having to take multiple jobs to afford second-rate coverage, is an individual who lacks empathy, a singularly important dimension of citizenship. Rehabilitation professionals—especially the readers of this journal—already recognize the central importance of empathy for best practices. Here, we reference the clear and, frankly, inspiring mission statement of this journal: “Our mission is to encourage dialogue among rehabilitation professionals, patients, families and caregivers that describe the human condition as it experiences the impact of illness or disability.” The three of us, thankfully, have been blessed with good health so far, and have had relatively few stressful encounters of our own with the medical community. But as we have watched beloved family members suffer through illness and death, we have felt very clearly that having doctors, nurses, rehabilitation specialists, and other healthcare practitioners who understand the human condition is vital. Who among us cannot share a story of a health care professional who went the extra mile to treat us, or a loved one? And who among us does not have the opposite story of someone we met in a hospital, or rehabilitation clinic, or doctor’s office, who did not? In and of itself, we are confident that any health care professional who is trained to think of the human condition—who views the patient they see as a person rather than as a case—is a better health care professional than someone who does not. It is easy, and perhaps traditional, to think about citizenship education as preparing people for lives as politicians, or citizen activists, or even as voters. We choose to make a broader argument, suggesting that effective citizenship education prepares each of us for the multiple roles we play on this planet we all share. For some, it means marching, or letter-writing, or running for office. We applaud these people, and acknowledge the work they do to improve our world. Whether one finds politics interesting or boring, noble or demeaning, we all must realize that political decisions are always made by those who show up. But for others—most of us—our opportunity to improve the world comes in other ways, through jobs outside the political realm. It has been the mission of each of our careers to train students to have disciplinary expertise, but nonetheless recognize the value of other disciplinary perspectives and to embrace humility in the face of complexity and ambiguity. We want them to be empathetic practitioners of whatever fields they enter. With such preparation, they play a role in making our world a more hospitable place. Cogan A. From surviving to flourishing: using narrative as a tool for patient centered care. Journal of Humanities in Rehabilitation. Published November 30, 2016. Accessed July 25, 2017. 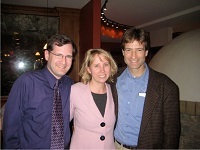 Smith MB, Nowacek RS, and Bernstein JL, eds. Citizenship Across the Curriculum. Bloomington: Indiana University Press; 2010. Smith MB, Nowacek RS, and Bernstein JL. Don’t retreat. Teach citizenship. Chronicle of Higher Education. January 19, 2017. Accessed July 25, 2017. Sullivan, WM, and Rosin, MS. A life of mind for practice: bridging liberal and professional education. Change. March/April 2008; 40 (2), 44-47. Colby A and Sullivan WM. Strengthening the foundations of students’ excellence, integrity, and social contribution. Liberal Education. Winter 2009; 95 (1), 22-29. Aschwanden C. Science isn’t broken. FiveThirtyEight. August 19, 2015. Accessed July 25, 2017. Tetlock PE. Expert Political Judgment: How Good Is It? Princeton: Princeton University Press; 2005. Silver N. The Signal and the Noise: Why So Many Predictions Fail but Some Don’t. New York: Penguin Books; 2012. Clarke, DJ. The role of multidisciplinary teams in stroke rehabilitation. Progress in Neurology and Psychiatry. July/August 2013; 17 (4), 5-10. National Federation of Independent Business v. Sebelius, 567 U.S. 1, 183. Garcia JD. Lessons outside the classroom: the Moultrie migrant farmworker experience. Journal of Humanities in Rehabilitation. November 30, 2016. Accessed July 25, 2017.